An extraordinary quality finish does not come inexpensively, and it’s not simply a matter of more talented tradesmen being paid more to execute the job. There are often layers of conscientious details that create the luxurious look and feel seen in quality custom homes. Many homeowners are surprised by the price that skilled tradesmen charge. However, when compared to more production-based subcontractors, the proposals from a custom builder’s subs may seem overpriced, but it’s often not an apples-toapples comparison. Take a professional painter, for example. To achieve a beautifully smooth and durable wall and trim finish, drywall and trim preparation is paramount. Assuming a quality drywall installation, a painter whose quality meets the demands of a luxury custom home will obsessively follow a multi-step process of sanding, masking, caulking, filling, priming, sanding, caulking, and filling again before opening the can of finish coat. This painstaking process is laborious and time-consuming, but it is necessary for custom home quality. For casing, crown molding, baseboards, and other interior trim finishing, a similar multi-layer process is followed to achieve a “furniture grade” finish that eliminates imperfections in the wood and joints between trim pieces. 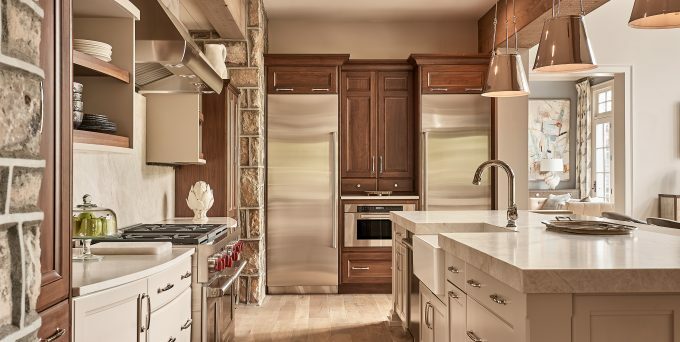 A more stringent, detailed process is typically followed when custom cabinetry is finished on site, hence the potentially high cost of custom built and finished cabinetry. Overall, this requires additional time and material from the painters, but it also requires a building team with trained eyes for detail to ensure the fine finishes are being executed to standard. Adding to the complexity, a quality paint job can’t fix a botched drywall install, and even the best drywall and trim installers in the market can’t easily cover up a warped framed wall or an out-of-level subfloor. Meticulous labor, supervision, and quality materials are required throughout framing to ensure wall, ceiling, and floor finishes can be installed with precision. Framing materials, which can range from two-by-fours to pricey options like laminated veneer lumber, engineered joists/studs, masonry, and steel beams, are specified during design/ engineering. This means that it’s too late in the game to stiffen floors and walls during the paint and floor selection process. Those uneven gaps and joints may not be the finisher’s fault, after all. Behind gorgeous finishes are layers of thoughtful design, hightouch labor, and stringent quality control that unquestionably result in higher prices. But there are no shortcuts to craftsmanship. Bost Custom Homes has been integrating these layers of quality detail into our standard process for three decades. We believe a home is a livable work of art, and we are passionate about designing and building forever homes for our clients – homes that will remain beautiful for generations to come. We realize we’re not everyone’s builder, but for those seeking a luxury custom home of top quality craftsmanship, livability, durability, and efficiency, we are prepared to welcome you to our team.